Akai always releases cutting edge music equipment. 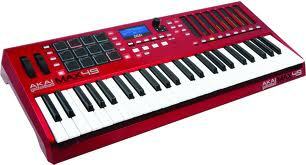 The Akai Professional Max49 USB keyboard is amazing to use. It has the famous drum pads, 49 semi-weighted keys for amazing playing, and AkaiConnect auto mapping software so you can use it with your favorite digital audio workstation. This way you do not have to spend along time setting up controls. It easily will work with VST plug-ins too. Most everything is back lit. It also has eight LED touch faders which can be used as analog faders. Simply drag your fingers across the touch strip. I use this thing constantly. It sells for around $500 at Guitar Center. Use the link below for exclusive deals.